Sidney's Ratez Roberts dunks during a nonconference game on Monday against Lehman Catholic in Sidney. Sidney's Andre Gordon makes a one handed dunk during a nonconference game on Monday against Lehman Catholic in Sidney. Sidney’s Dominick Durr shoots as Lehman Catholic’s RJ Bertini defends during a nonconference game on Monday in Sidney. Lehman Catholic’s Elliott Gilardi drives as Sidney’s Jace Conrad defends during a nonconference game on Monday in Sidney. Lehman Catholic’s John Cianciolo drives as Sidney’s Andre Gordon reaches for the ball at Sidney Monday. Lehman Catholic's Bryce Kennedy shoots as Sidney's Lathan Jones defends during a nonconference game on Monday against Lehman Catholic in Sidney. 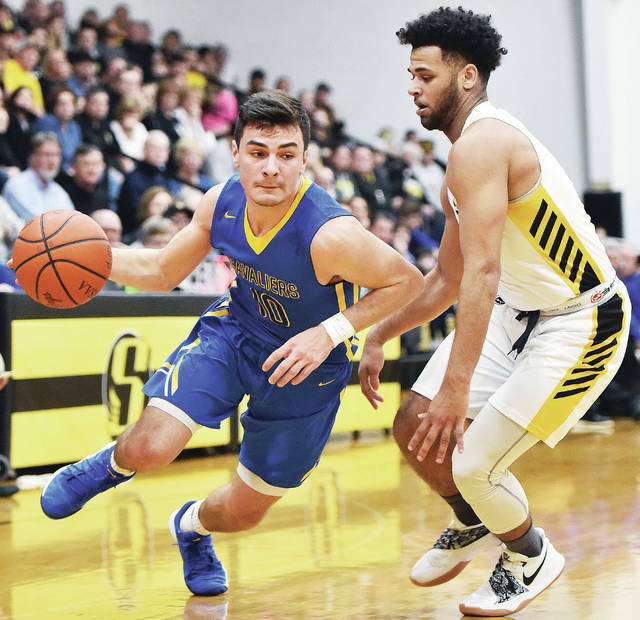 Sidney's Andre Gordon shoots as Lehman Catholic's Bryce Kennedy defends during a nonconference game on Monday against Lehman Catholic in Sidney. Sidney junior guard Darren Taborn has his pointer finger damaged while playing against Lehman Catholic Monday. 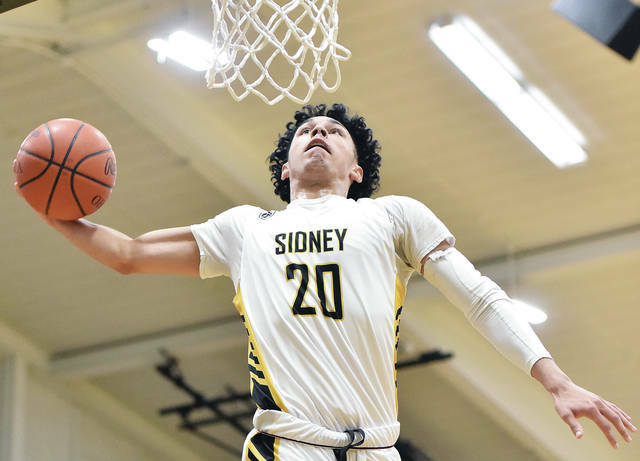 SIDNEY — Ending a busy one-week stretch with another victory came almost effortlessly for Sidney on Monday. 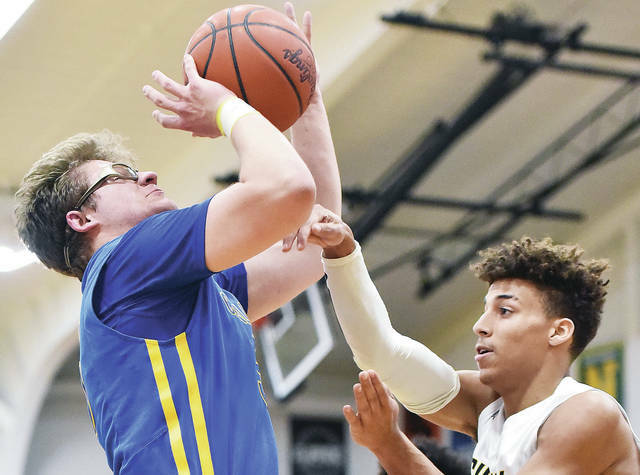 The Yellow Jackets dominated crosstown rival Lehman Catholic from the start in a 72-37 victory, which is the team’s fifth since last Monday. Sidney frustrated the Cavaliers for most of the game on defense and flew over them on offense. 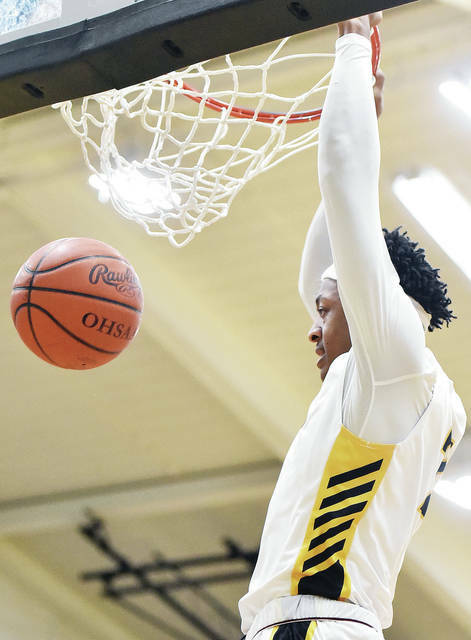 The Yellow Jackets had at least 11 dunks, including a windmill dunk by Andre Gordon in the first half that brought most of the half-filled gym to its feet. Gordon, a Virginia Tech commit, led all scorers with 20 points. Senior forward Ratez Roberts and senior guard Keith Lee each added 10. Jones added eight points off the bench, including a pair of high-flying dunks. 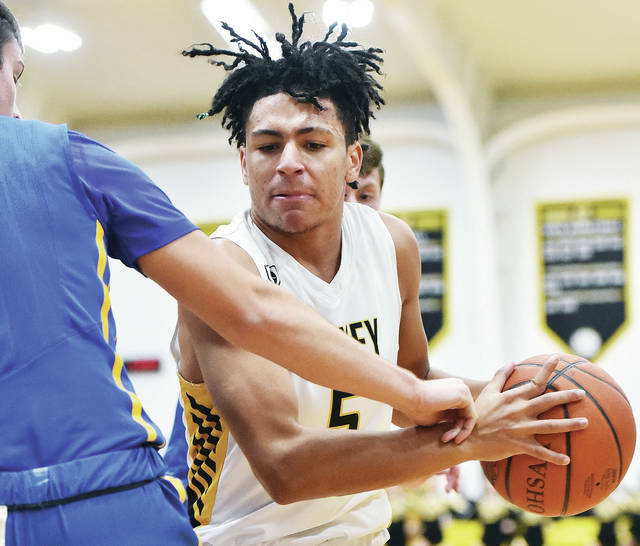 Jones, a 6-foot-3 forward, is in his first season playing high school basketball, and Willoughby said he’s been pleased with his progress. Jones has been a reliable inside defender and rebounder when needed. 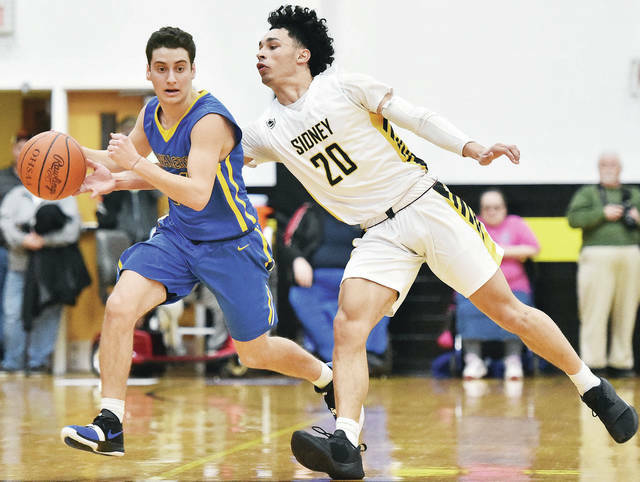 It was the final nonconference game of the season for Sidney (16-3), which has three Greater Western Ohio Conference American North Division games left before starting tournament play later this month. The Yellow Jackets will travel to archrival Piqua on Friday, host Vandalia-Butler next Tuesday and travel to Greenville on Feb. 15. Victories over all three opponents would clinch Sidney the North title outright. The Yellow Jackets, which are tied for first place with Butler, have won at least a share of the league title for the last three years. “That’s the way it’s supposed to be,” Willoughby said. “You come down to the end of your season where you’ve got to win the last three games to win it. Friday’s game will be Sidney’s last before the tournament draw on Sunday. The Yellow Jackets are among the favorites to earn the Dayton Division I sectional’s No. 1 seed, along with Springfield and Butler. Springfield, Sidney and Butler are the only Dayton-area Div. I teams that have lost to only one other Dayton-area D-I squad. All other squads have at least two losses to other teams in the sectional. Sidney took an 11-2 lead by the halfway mark of the first quarter and cruised from there. The Yellow Jackets had six dunks in the first half — including one each by Jones and Gordon in the final minute of the second — and led 36-17 at halftime. The Yellow Jackets pushed the lead to 53-25 by the end of the third and opened the fourth with a 10-3 run. Bench players for both teams played in the game’s last four minutes. Bryce Kennedy led Lehman with 10 points while Luke Frantz finished with seven. The Cavaliers (7-9) will play next on Friday at Lima Perry in Northwest Central Conference action. They’re currently third in NWCC standings. Sidney’s Ratez Roberts dunks during a nonconference game on Monday against Lehman Catholic in Sidney. 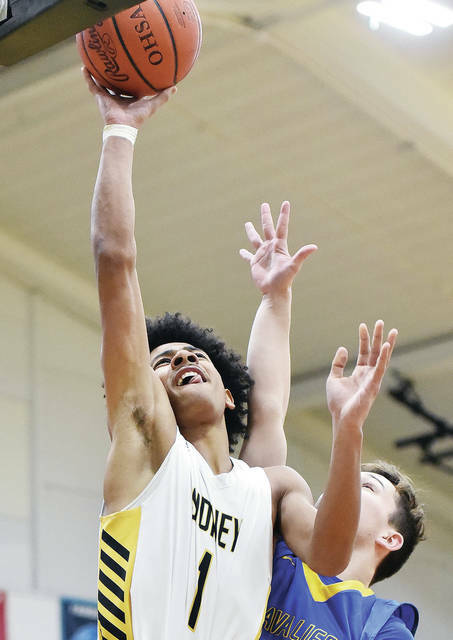 https://www.sidneydailynews.com/wp-content/uploads/sites/47/2019/02/web1_adfhhtfhjt-2.jpgSidney’s Ratez Roberts dunks during a nonconference game on Monday against Lehman Catholic in Sidney. Sidney’s Andre Gordon makes a one handed dunk during a nonconference game on Monday against Lehman Catholic in Sidney. 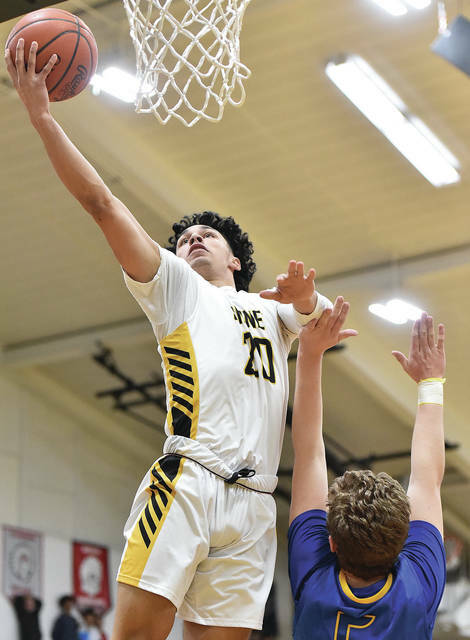 https://www.sidneydailynews.com/wp-content/uploads/sites/47/2019/02/web1_DSC_0584-2.jpgSidney’s Andre Gordon makes a one handed dunk during a nonconference game on Monday against Lehman Catholic in Sidney. Lehman Catholic’s Bryce Kennedy shoots as Sidney’s Lathan Jones defends during a nonconference game on Monday against Lehman Catholic in Sidney. Sidney’s Andre Gordon shoots as Lehman Catholic’s Bryce Kennedy defends during a nonconference game on Monday against Lehman Catholic in Sidney. This entry was tagged Andre Gordon, basketball, boys, boys basketball, Bryce Kennedy, Cavaliers, Dominick Durr, Elliott Gilardi, high school, hoops, John Willoughby, Lathan Jones, Lehman, Lehman Catholic, Luke Frantz, Pat Carlisle, Ratez Roberts, sectional, Sidney, Tournament, Trey Werntz, Yellow Jackets. Bookmark the permalink.